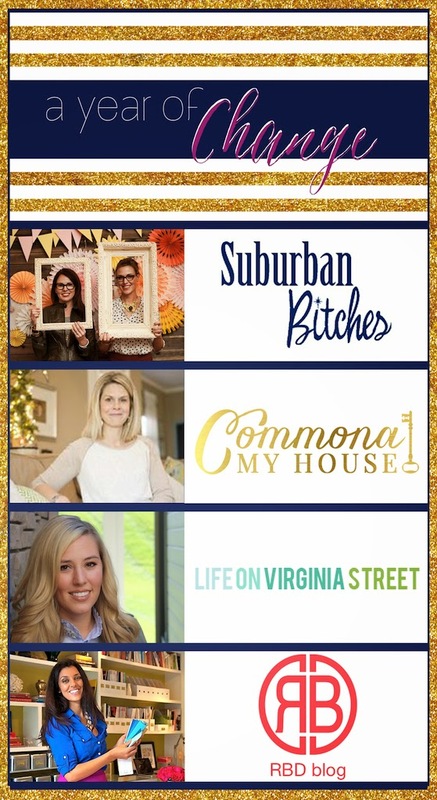 If you've been reading my blog for pretty much any time at all, you know that at the end of each month me and a few intrepid design cohorts bring you a little DIY project that we've each accomplished that month. Also if you've been following my exploits here for long you know that I'm sort of between houses. I sold my home in LA this past Spring (but not before having it photographed for a home tour featured on Domaine Home) and am about to launch into a remodel on my next place (we've finalized the architectural plans and are working on the engineering and permitting process now! Hoping to break ground in October.) My interim apartment is cool but small, and being a renter doesn't afford an over-abundance of DIY opportunities. All this to say that once again this month I'm sharing a project I did in a client's house rather than my own, but it's a good one and I think you'll like it! 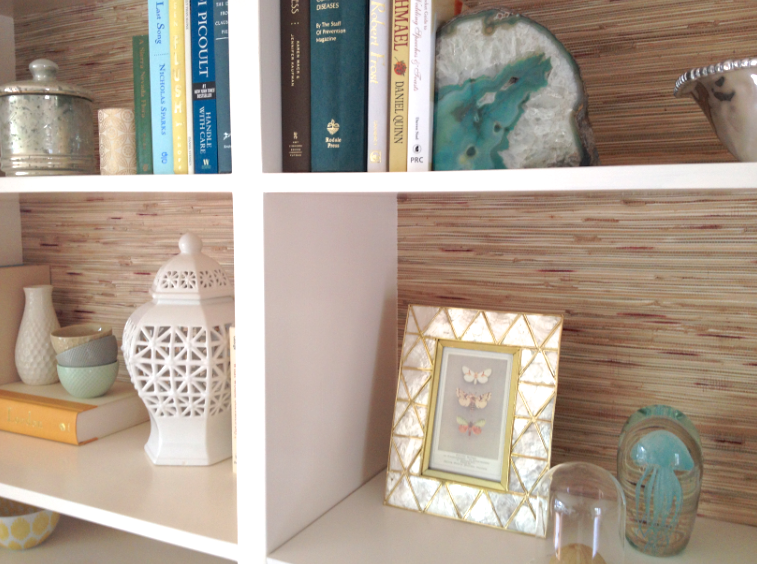 The challenge this month was to put our bookshelf styling skills into action. 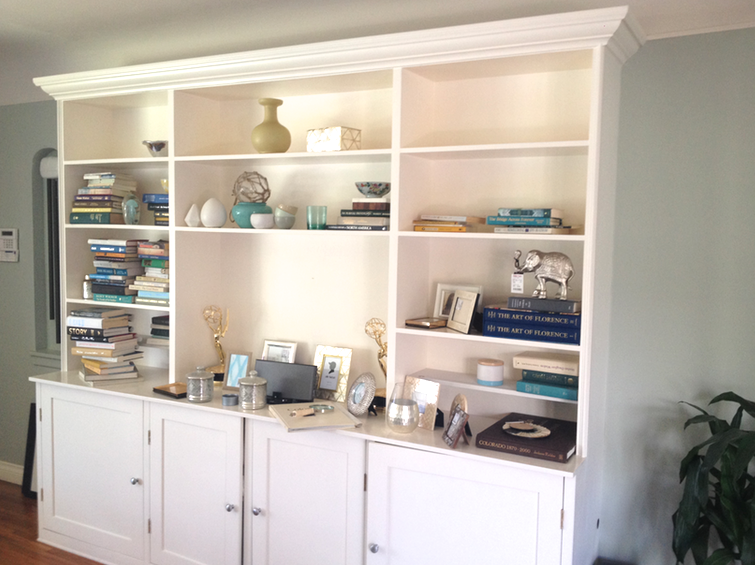 I had this big, beautiful built-in bookcase to work with, and the transformation was pretty major. 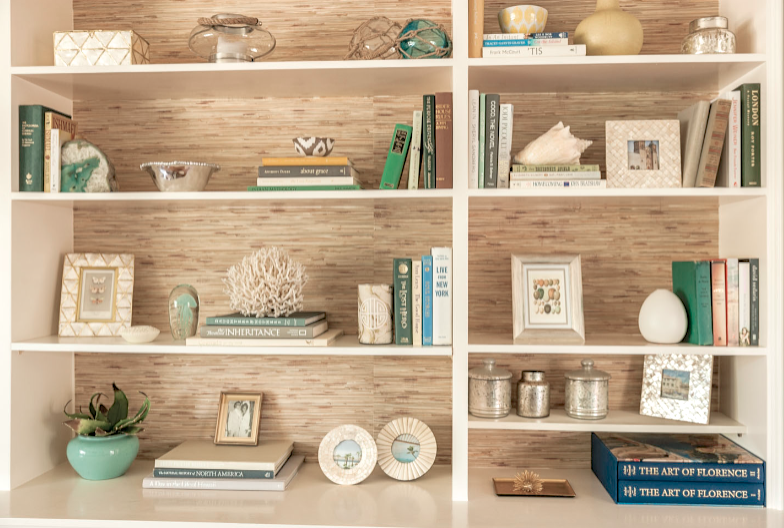 My first step was to bring some texture and a casual beach-y feel to the room by lining the back of the bookcase with sea grass wallpaper. 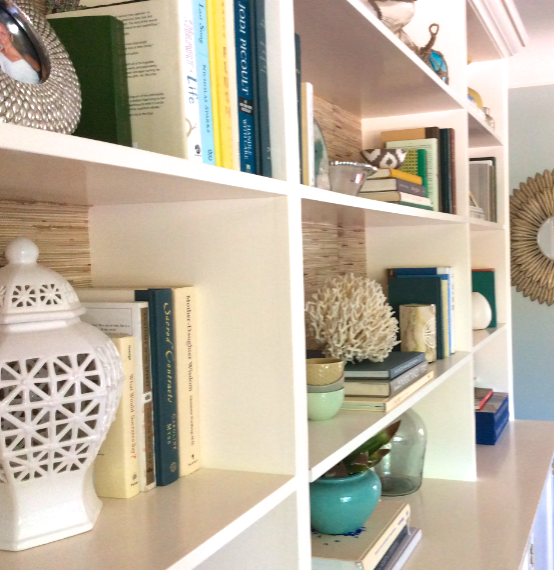 *designer tip: paint or wallpaper the backs of your bookshelves. 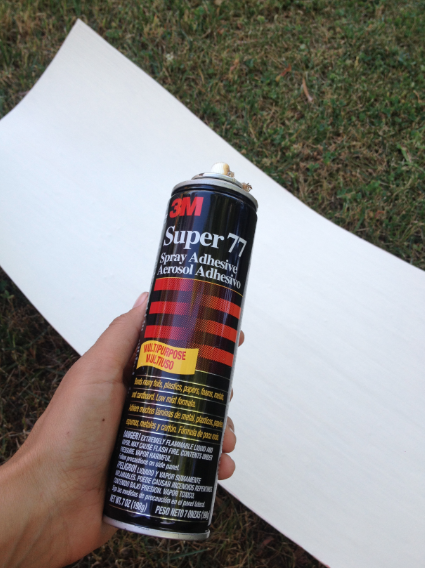 This is the sea grass wallpaper that I simply cut to the size of each opening and glued up using spray adhesive. The whole process was ultra simple and easy. Foolproof, really! 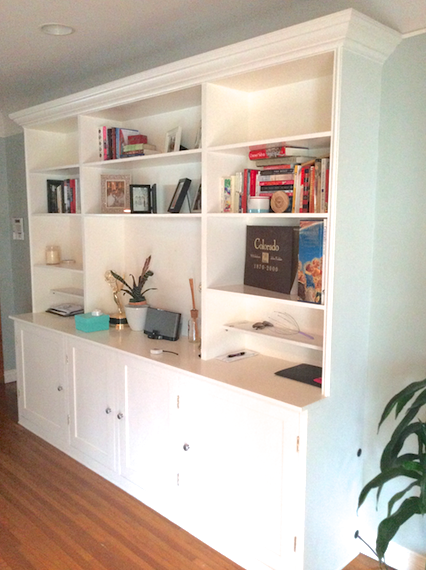 There was a large opening in the center of the bookcase where a TV was previously installed, but we had other plans for the TV, so I got a piece of smooth plywood cut at Home Depot to fill the space and I painted it to match. I get these from thrift stores by the armload. I select them mostly for the color of the spine (not the dust-jacket, which I always remove), but luckily it's also not that difficult to find books on interesting topics as well. I usually pay around 50 cents to $4 each depending on the book. Vases, boxes, bowls, spheres, figures, sculptures. My top two sources for this are thrift stores and Home Goods. 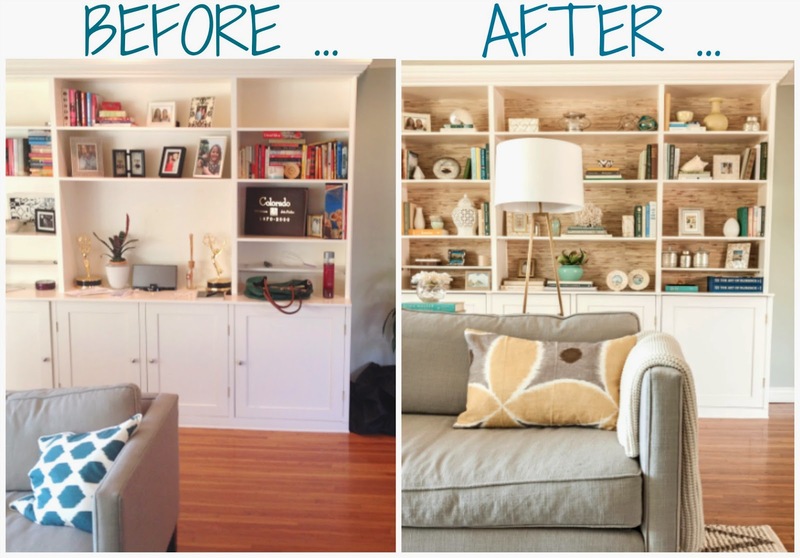 But West Elm, CB2, and Target are also great resources. 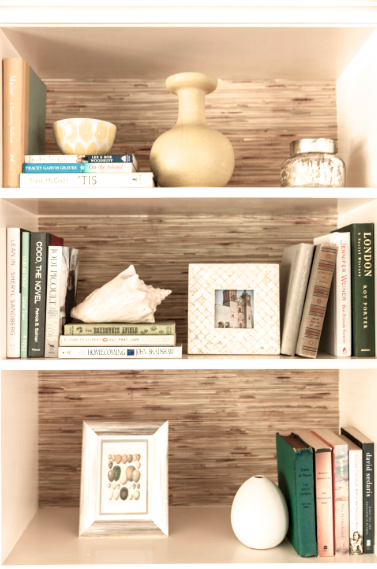 *Picture frames made with texture, patina, or interesting materials. There are far too many cool frames widely available out there to mess around with boring ones. 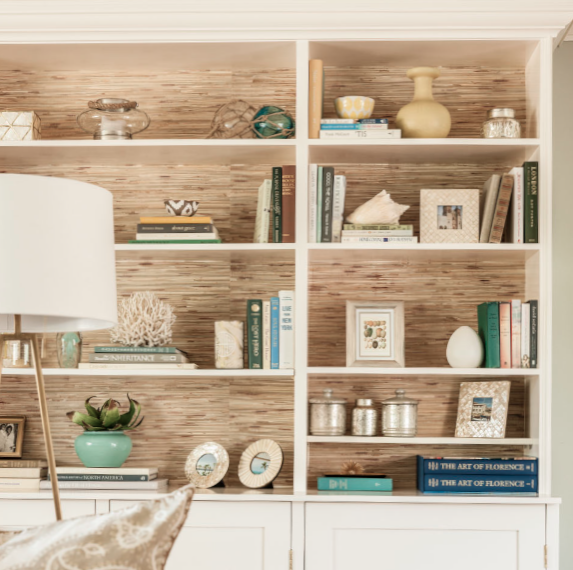 So my rule of thumb is that they've got to special: inlaid bone, capiz shell, metallics, tortoise, shagreen ... something that elevates the design (which should really be your rule of thumb for everything in your home.) 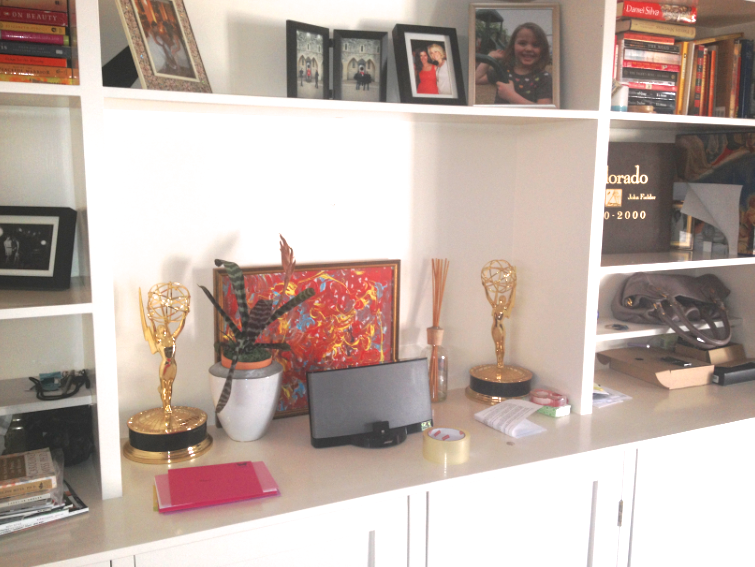 Home Goods, Cost Plus, Target, and Pier 1 are all good sources for interesting and affordable picture frames. 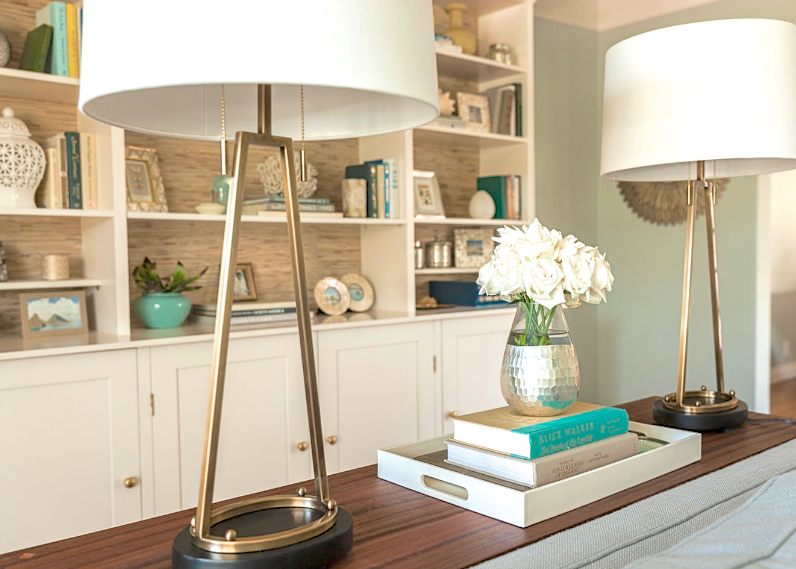 *designer tip: choose a defined color palette, but be sure to include an array of shades and tones within that palette. In this case I used blues, aqua greens, browns, whites, and yellow. I used many shades and variations of each of these colors, which helps to provide depth, but I didn't use any orange or red or black, for instance, which would have been too much of a departure from my color palette. Books should be arranged both horizontally and vertically to break up the repetition. Top a horizontal stack of books with an interesting object. 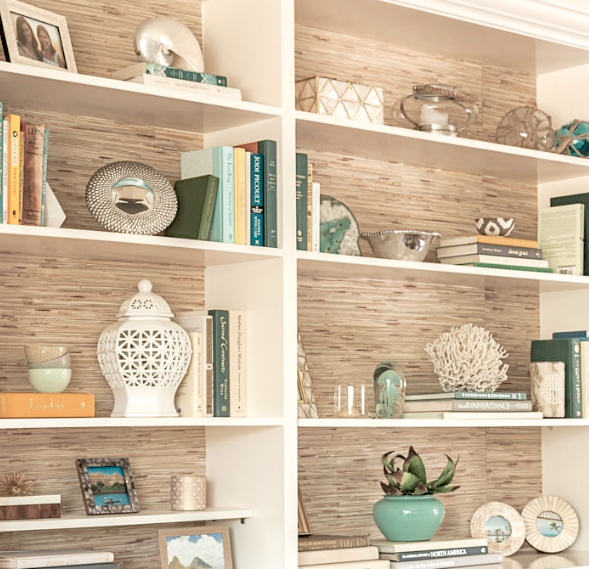 Vases, beautiful storage boxes and sculptures can be used as "book ends" to hold up your vertical groupings of books. *designer tip: mix it up. Don't overdo it with any one category of objects. The key is to strike a nice balance. All books with no interesting objects to break it up would be boring. Too many picture frames would get repetitive. Mix it up. *designer tip: think in layers. 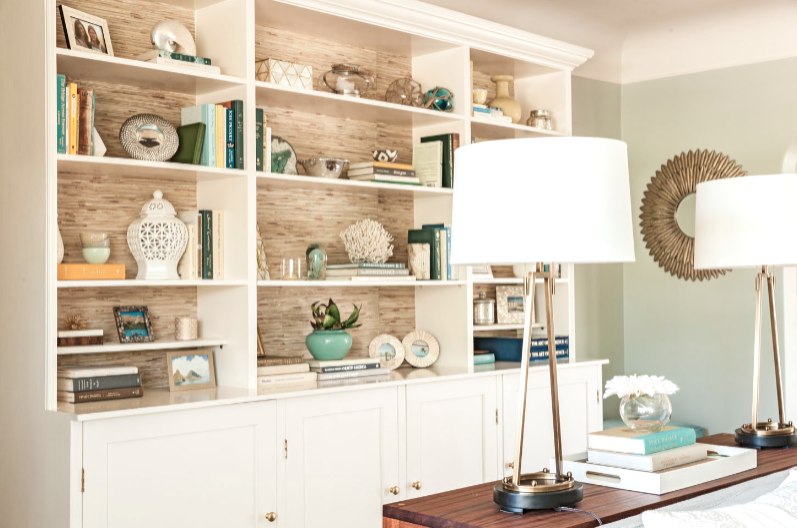 In addition to layering from top to bottom like this coral atop a horizontal stack of books, you also want to layer from front to back. 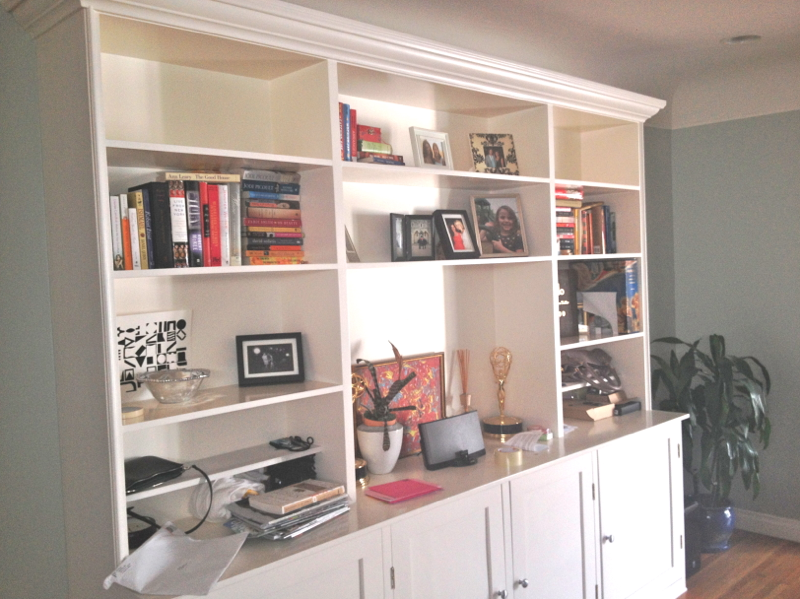 A pretty painting or a framed photo or quote propped behind other decorative objects looks great and adds depth. *designer tip: pile it on and then edit, edit, edit. 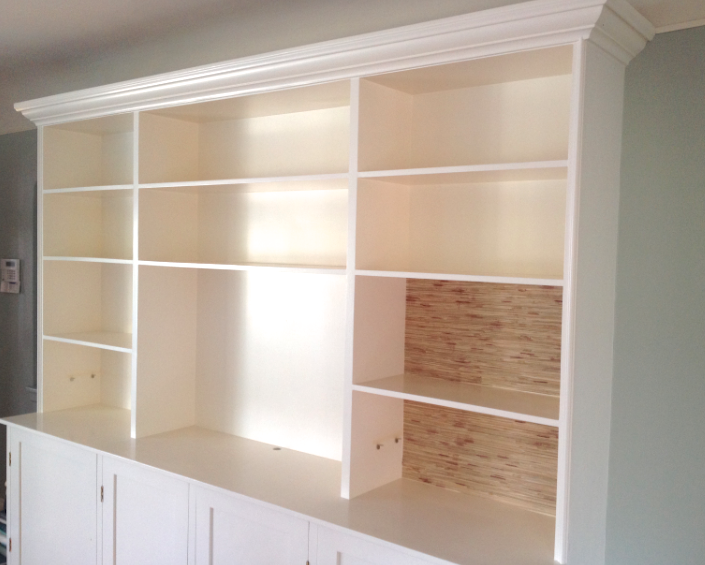 It's amazing how much filler a big shelving unit like this holds! When you're in the thick of the styling process you'll be unloading and moving around armloads of stuff, but it might not all work together in the end. Leaving some negative space is important too (in other words don't fill up every square inch of space ... give the eye some breathing room by allowing a bit of open space in your design.) 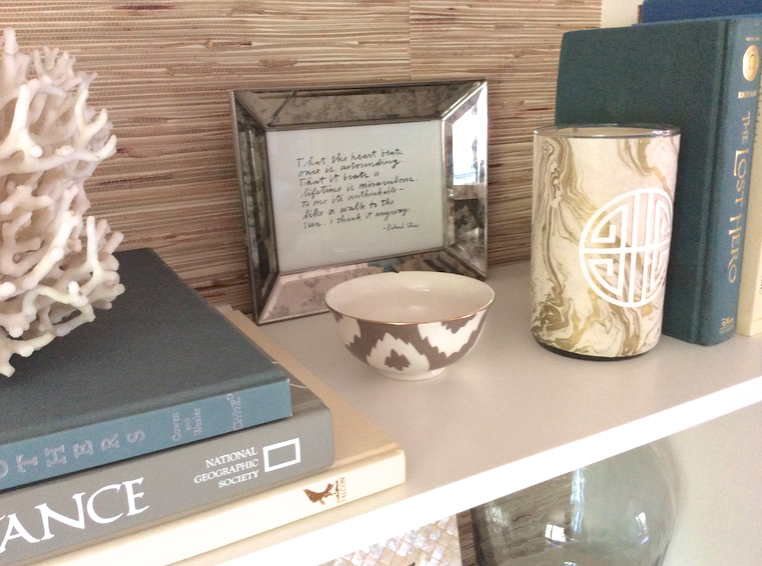 An important final step is to gradually edit your collection down to the objects that best reflect your style and the things you love most ... or those that just simply make you smile every day to walk past them. 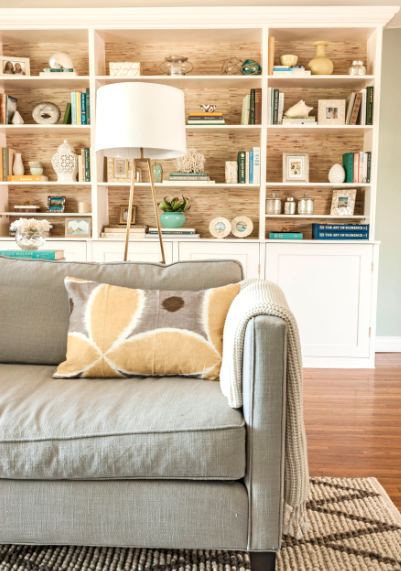 Now be sure to check out the bookshelf reveals from all my fellow design challengers, and maybe even go re-style a shelf of your own! fantastic! they really make the room look so much more put together. great tips! Thank you I love hearing your feedback and knowing that you've enjoyed a post!